A new record has been set at $97,000! Thanksgiving came a couple of days early last week. At Tuesday's meeting, Tom Nelson(left) and Mike Wier (right), who head up our Harvest Howl fundraiser each fall, gave us the news of our "winnings" from the event. Amazingly, we've hit a new high - we not only set a new record, but left the old one in the dust. 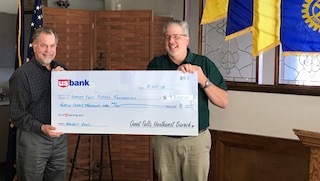 Between the tickets sold, the food served, the 50-50 tickets split, and very successful silent and dessert auctions, Mike and Tom were able to write a check to the Great Falls Rotary Foundation for $97,000! That money goes directly to Camp Rotary, the signature project of Great Falls Rotary, and a commitment of such long duration and high ambition that it makes our club unique in the state. This is the pay-off for all our hard work. Our thanks to the many leaders who made the work organized, do-able, and very, very productive.